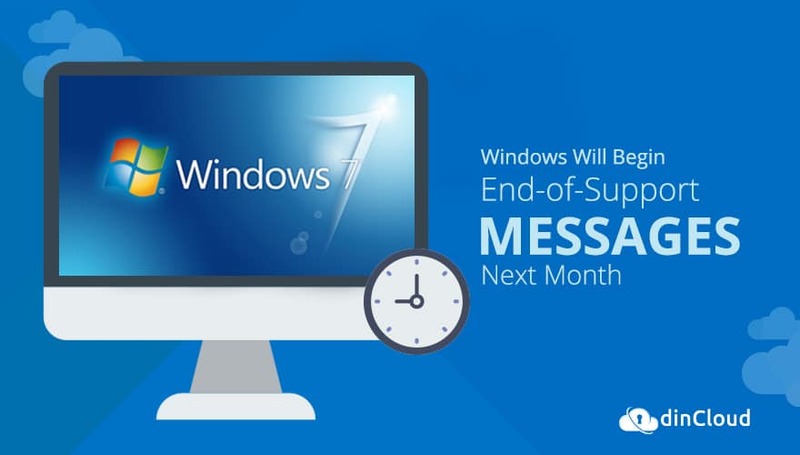 Starting in April, Microsoft will begin sending the end-of-support messages for the Service Pack 1 of Windows 7, in preparation for the final end-of-life of the operating system date of January 14, 2020. The announcement issued by Microsoft’s Corporate Vice President Matt Barlow on Tuesday shared how Microsoft would begin courtesy reminder notifications on Windows 7 desktops, and that these notifications can be opted out of after the first reminder. The change has been getting quite a bit of attention from the industry as the date becomes closer and businesses like yours should be looking closely at all the options available to you to manage the transition. Options include a full migration from Windows 7 to Windows 10, the purchase of a Windows 7 Extended Security Updates Plan, which enables organizations to extend security updates and patches for 3 years beyond the January 14, 2020 deadline or migration to a hosted virtual desktop solution. Organizations can achieve the benefits of Windows 10 immediately, without the challenges of a full migration. Most systems are unable to handle the processing power and other system requirements to fully utilize the features of Windows 10, requiring businesses to not only pay for a new operating system but also new hardware to run the solution. Hosted Virtual Desktops take this challenge out of the equation. The provider takes on the processing power, storage and update requirements, leaving your business to only worry about maintaining access to an internet connection to utilize your desktop solution, essentially turning your computer into a “dumb” end-point. This can turn your complicated, months-long migration process into an overnight success. Anytime, anywhere access: The user’s data is maintained on an external server that is accessible to someone with the proper credentials regardless of their location or device. Your business can now access their work documents whether they are on a plane, train or automobile, in the office or at lunch or home, while maintaining the security of your businesses private data. Reduced IT complexity: Business IT teams have a big job on their hands. The technology of the computer network is key to maintaining the productivity and ability of the business to provide the essential product it offers. The need to procure, maintain, and secure these systems can take up a lot of IT’s valuable time and resources, that could be better spent on tasks directly related to the growth of the business and product. Hosted Virtual Desktops do this by taking the maintenance and security challenges off the shoulders of the IT department and placing them on the hosted providers shoulders, meaning all your IT staff has to do is procure the system the employee needs to access the corporate workspace. Enhanced Data Security: It should come as no surprise that as cybersecurity protection techniques get stronger, so does the ability of the malicious sources to break through those protections. It can be a full-time job of your IT department simply to keep up with the quickly changing landscape within cybersecurity. Not to mention the training and knowledge you need to have on staff to effectively counteract this fast-changing threat. Here, again, is where Hosted Virtual Desktops can give you a big advantage. Service providers, especially ones like dinCloud who are “born in the cloud,” recognize this challenge and have taken significant time and invested significant resources in the way of talent and procurement of security protocols to ensure your data has the best data security in the industry. Increased flexibility and scalability: Physical network implementations of desktop management have one major downfall. There is a limit to how much data it can process and store, leaving users in frustration when they are unable to access their desktop due to the system being maxed out. The instant-on nature of Hosted Virtual Desktops means that the infrastructure fluctuates with the needs of the business. So if the demand for resources is greater than what you anticipated, it is easy to increase or decrease the resources with the click of a mouse, ensuring that all employees have access everywhere and every time they need it. Reduced Costs: Yes, this is true. While this benefit is in many ways assumed by moving to a cloud-based solution, it bears discussion. When you look at the typical lifecycle of a physical desktop implementation for your business, you are replacing your entire network at least every 3 years. Hosted Virtual Desktops can increase this number by increasing the lifespan of your endpoints. The processing power no longer needs to reside with the endpoint; instead, it rests on the shoulders of the service providers hardware, increasing the life of your endpoint. When you have to replace your hardware less often, this can provide significant savings on your CapEx budget. There. We said it. And the only way this is possible is by moving your Windows 7 machines to point to a hosted virtual desktop solution. dinCloud is one of the few Microsoft partners who is authorized to offer Windows 10 in the cloud. Set up your free consultation today and see how you can painlessly migrate your network from Windows 7 to Windows 10.